More cold air = more horsepower! AMSOIL offers universal air induction filters (EaAU) designed to replace stock oil wetted gauze or foam conical filters that were supplied with custom induction systems produced by K&N, Injen, S&B, Green, AIRAID, AFE, TrueFlow and others. AMSOIL Ea® Air Induction Filters fit most of the popular intake systems available. They provide improved cold air intake and a level of engine protection only an Ea® Filter can provide. EaAU Filters are made from high-quality synthetic nanofiber media. In lab testing, the nanofiber media found in EaAU Filters removed 5X more dust than the average cellulose filter and 50X more dust than the average wet-gauze media, delivering excellent protection against wear-causing contaminants entering the engine. And to clean them simply use low-pressure shop air or vacuum! 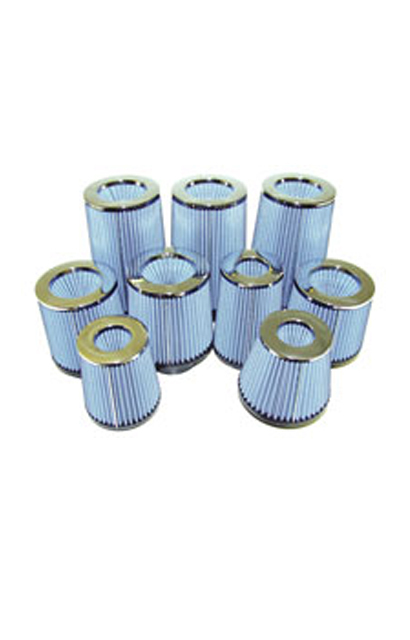 Designed to replace stock oil-wetted gauze or foam conical filters that were supplied with custom induction systems produced by K&N, Injen, S&B, Green, AIRAID, AFE, TrueFlow and others. AMSOIL EaAU Universal Air Induction Filters offer better efficiency, excellent airflow and are cleanable. AMSOIL offers universal air induction filters (EaAU) designed to replace stock oil wetted gauze or foam conical filters that were supplied with custom induction systems. EaAU Filters are available in a range of sizes to fit most popular aftermarket performance intake systems available. They come with a clamp for convenient installation. Consult the guide below to determine the correct filter for your application. AMSOIL offers Ea Pre-Filters (EaPF) for racing and off-road applications. Ea Pre-Filters prevent large particles from sticking to EaAR and Ea Racing Air Filters (EaAU) and blocking airflow. * Filter has port(s) for engine sensor(s). See detailed EaAU specifications and photos for more information.